« Katia’s Life Saving Film: Saving America’s Wild Horses: Film North International Festival!! Sept 24 and 25th!!! NETWORKING FOR THE ANIMALS WORKS!! A lot is happening all over my friends. Thankfully keeping up on all of it is made easier when one subscribes and or bookmarks specific groups and links. The information below is by way of C4P located in Toronto, Ontario…isn’t networking just great!!! Thank you Michelle for allowing me to re-post and get the word out. Please open your hearts (and wallets) to help Nicole Joncas of TEJA’s Animal Refuge to buy firewood for the winter and have her old, beat-up truck repaired. Someone had promised her to give her his used car, but than preferred to sell it for $$$ ! Nicole is Quebec’s foremost animal activist, and without her bringing awareness about Puppy Mills, I would have never known that these deplorable conditions existed. Kindly send your tax deductible donation to: TEJA’s Animal Refuge, 21511 McCormick Road, Glen Robertson, ON K0B 1H0 non profit org.# 85496 4202 RR0001 www.tejasanimalrefuge.ca or go on her website and transfer your donation directly. Any little amount will help. Thank you. Rusty & Bear: 4 yr. Brothers, ‘Gentle Giants’ Yellow Labrador Retriever Mixes Size Extra Large • Adult • Male 519-966-5751 Windsor They are a bonded pair of family pets (ask what age children) who need a home together. To separate such a pair can negatively affect their health. They will keep each other company when you are not home. Labs of this age need regular exercise and can also be settled companions. 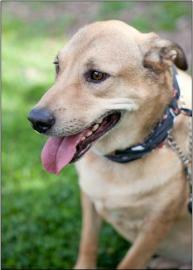 Shelter states: “Rusty & Bear are Lab Shepherd mixes who need to be adopted into the same home. They were brought to the shelter when their family moved. 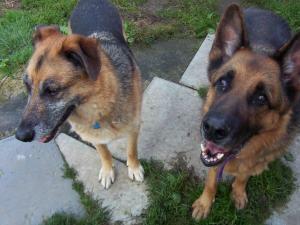 They are both large/extra large dogs but now even moreso because they have not been exercised and are *overweight. Both are described by their former family as sweet and affectionate. Rusty is ~130 lbs. good on leash, plays with toys! Bear is ~100 lbs. good in the car, knows sit, stay, come, and down commands. He is afraid of loud noises and is pretty mellow. Adoption Includes: 45 days Ontario SPCA Pet Insurance Standard Vaccinations (excluding rabies) Microchip identification Spay/Neuter Flea treatment Deworming Heatworm testing for dogs Dogs receive three training sessions as part of their adoption fee.” *Good quality natural food and regular moderate exercise should help them to drop some pounds and will surely affect their long-term health. 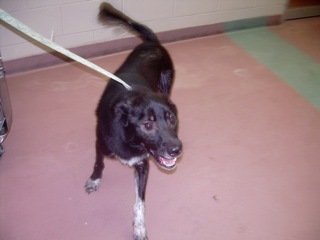 BORDER COLLIE MIX MALE NOT NEUTERED This boy came in as a stray. Came in, in rough shape. Missing hair on back end (fleas) which is growing in nicely and has overgrown nails. We guess his age to be about 4ish years old? He is very hyper in the kennel and starting to get really vocal probably due to him sitting there for so long already. 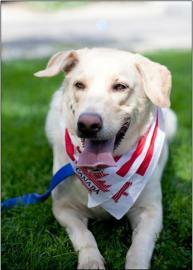 He is an active boy and will benefit from an active life style. -handling test – once he finally settled down, I was able to look in his ears, mouth, pinch his toes, grab tail and hips with no reaction from him at all. -food test – ate around the tester hand and took bigger gulps of the food when the hand approached his bowl. He did place his mouth on the tester hand (as a warning) but didn’t snap or bite it. -meeting staff- happy to greet/meet anyone he see’s! -dog on dog – totally avoided the tester dog (lab X). It didn’t bother him that the other dog was there he was just not interested in her. I couldn’t get him to focus on the bunnies at all. COLLIE MIX FEMALE NOT SPAYED This girl came in as a stray. Maybe about 8 months old? VERY active and hyper. She isn’t very mannerly and constantly jumping up on people and things. Knows some basic commands like sit. Very busy and always on the go. Wouldn’t recommend a home with ANY small animals or children. She needs exercise +++ -handling test – HYPER, HYPER!! Once she settled down she let me look in her ears, mouth, pinch toes, grab tail and hips with no problems. -meeting staff – happy go lucky girl and happy to greet/meet anyone. will jump on anyone. -food test – she ate all around the tester hand when hand approached bowl. She didn’t lose focus on the food and took bigger gulps. -dog on dog – met a female pittie X. Her body was stiff, hackles slightly raised and rushed right in to greet dog but wasn’t quite sure of her. Once she saw the bunny she completely lost focus of the tester dog (that was right beside her) and fixated +++ on that bunny. took her up to the bunny cage and she snapped quite a few times at the cage trying to get at the bunny. With proper greeting and exercise/supervision shouldn’t be a huge problem with other dogs. 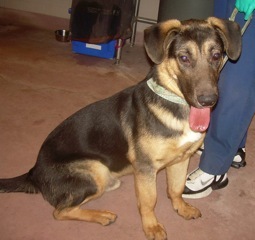 SHEPHERD MIX MALE NOT NEUTERED: This boy came in as a stray. Guess his age to be about 10 months-1 year. Overall a nice boy. 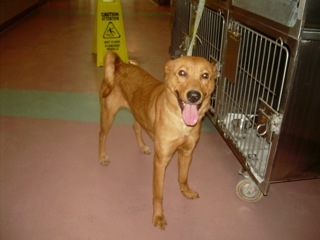 He is young and needs training, needs confidence building and leash training. He panics/flails when leash is pulled to tightly. A little goofy at times and calms down nicely. Will probably bond pretty quickly with his new owner. -handling test – was able to look in ears, mouth, pinch toes, grab tail/hips with no problems other then when I pinched his toes he got a little mouthy with me but no pressure. -meeting staff – he approaches on his own when meeting other people and shows some hesitation. A little nervous at first but calms down -food test – no reaction from him at all when tester hand approached bowl while eating or taking food bowl away. Good boy. -dog on dog – was very odd meeting 1st test dog, flailed up on back, legs pulling to get away. Retested with a female dog and he seemed a little more relaxed and met with no problem. When we were walking the female dog away he started to flail again. Took him up to the bunnies. ears perked up, bright eyes when he saw the bunny move. Use caution with small animals until you get to know him and his personality. EVENTS – PLEASE MARK YOUR CALENDARS AND COME OUT – MEET YOUR RESCUE COLLEAGUES, FORGE NEW RELATIONSHIPS, GET CONNECTED! IS ALL THAT KILLING NECESSARY? Bill Bruce’s lecture, “the Calgary Model” providing solutions to reduce euthanasia and end pet homelessness presented by ORA-Organization for the Rescue of Animals. 200 attending now – anyone and everyone in the rescue/shelter community should attend – not only will you gain incredible information, but you’ll also be able to network and build relationships with your colleagues in rescue – you never know when or how that new rescuer in your life is going to be able to help you move your next animal to safety..
Congratulations to Rob Goddard & www.helpinghomelesspets.com / www.helpinglostpets.com team for GREAT Pet walk in Markham yesterday – so good to meet to many of you who are part of this wonderful network. And StellaLuella got some critical socialization, not to mention a hamburger and two hot dogs. Wow. what a life for a girlie that was locked up and starved so cruelly for 4 yrs. Please do not breed or buy, while shelter pets die! GREAT NEWSLETTER MICHELLE, THANK YOU! !